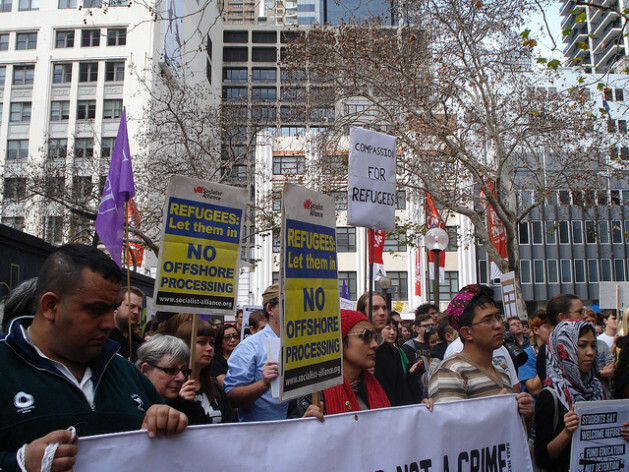 SYDNEY, Aug 5 2013 (IPS) - The Australian asylum policy of rejecting boat arrivals has been condemned by the United Nations Refugee Agency, Pacific island leaders, migration experts and human rights organisations. A new Regional Settlement Arrangement agreed between Australian Prime Minister Kevin Rudd and Papua New Guinea Prime Minister Peter O’Neill, announced less than two months ahead of an Australian national election, will see the removal of asylum seekers for refugee processing and resettlement in the neighbouring Pacific Island state of Papua New Guinea (PNG) located north of Australia, for an initial period of one year. At least 70 asylum seekers have already been flown to the PNG-based Manus Island detention centre under the new deal. On Aug. 3, Australia announced a similar arrangement with the tiny 21-square-kilometre South Pacific nation of Nauru, situated 4,500 km north-east of Australia, which also hosts an Australian offshore asylum seeker detention centre. According to an official Nauru spokesperson refugees will have temporary residence only. PNG, a Melanesian nation of seven million, is signatory to the 1951 Refugee Convention and its 1967 Protocol, but has reservations on the rights of refugees to basic services such as employment, housing and education. The country is ranked 156 out of 187 countries for development, and has limited capacity to absorb tens of thousands of additional refugees from another state. In exchange for taking Australia’s asylum seekers, PNG will receive an additional aid package worth 507.2 million Australian dollars (452 million U.S. dollars). According to Australia, the new policy aims to stop people smugglers and deter refugees from taking dangerous journeys in unseaworthy vessels. However, Hadi, an asylum seeker from Afghanistan who arrived by boat and settled as a refugee in Australia in 2011, told IPS that the new arrangement was an “election stunt using people who have no voice. “It will not make any difference. People who are getting on boats are desperate. They are leaving their countries to survive,” he declared. In August last year, Australia announced a ‘no advantage’ immigration policy directed at asylum seekers and announced it was reinstating offshore detention centres in PNG and Nauru. But unannounced maritime arrivals have increased rather than decreased, with 17,202 last year and about 15,000 so far in 2013. The number of asylum seekers that Australia receives is very low. Last year 15,790 or three percent of the total of 479,270 global asylum applications were lodged in the country, compared to the United States which received 83,430, or 17 percent of the world share, and Germany and France which received 64,540 and 54,940 respectively. Most of those arriving in Australia originate from Iraq, Afghanistan, Iran and Sri Lanka, and 90 percent are recognised as refugees. Will Jones at the Refugee Studies Centre of the University of Oxford told IPS that given Australia’s minor share of the world’s asylum seekers, the new policy was “completely disproportionate, extraordinarily expensive, and inefficient” for processing refugees. In 2011-2012, Australia’s Department of Immigration incurred expenses of 1.4 million Australian dollars (1.2 million U.S. dollars) for offshore asylum seeker management, almost half the department’s total costs, compared to 95,272 Australian dollars (85 million U.S. dollars) spent on managing asylum seeker processing within Australia. Refugee organisations have said that the new strategy jeopardises the protection of vulnerable people already suffering from trauma and displacement, who face an unacceptably poor framework of support. It reported harsh living conditions and poor standards of privacy, hygiene and access to medical services. The Australian government claims it will complete a permanent detention centre on the island in 2014 and meet the costs of the new settlement policy, but PNG will be responsible for all refugee assessments. PNG currently hosts an estimated refugee population of 9,500 with many entirely dependent on support from humanitarian and charitable organisations. They are especially vulnerable to high levels of human insecurity in a nation facing serious domestic challenges of basic service delivery, high unemployment and crime, widely prevalent gender violence and inadequate law enforcement. Unaccompanied minors arriving by boat face particular risks following the Australian government’s assertion that they will not be reunited with families in Australia. This is despite commitments to the best interests of children under the Convention on the Rights of the Child (CRC) and UNHCR’s settlement guidelines, which stipulate that no action should be taken to hinder family reunification for unaccompanied minors. Resentment has quickly emerged in the south-west Pacific against the refugee settlement ‘deal’ as an unwelcome imposition on neighbouring small island developing states and an abdication by Australia of its humanitarian responsibilities. There have been public denouncements by Fiji’s foreign minister, Ratu Inoke Kubuabola, and former PNG prime minister Sir Michael Somare. PNG opposition leader Belden Namah has renewed a legal challenge to Australia’s asylum seeker detention centre, in the country’s Supreme Court.